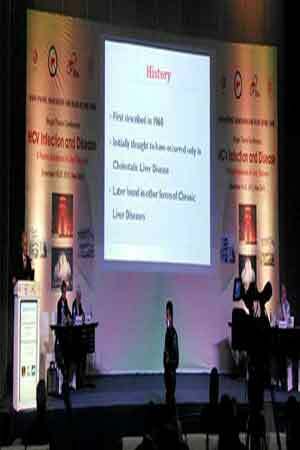 The Asia Pacific Association for study of Liver is organising a 'Single Theme Conference"' at Hotel Pullman, New Delhi, from 18th - 20th December, 2015. The theme of the conference is HCV infection and diseases along with special focus on recent advances in liver diseases. APASL is one of the leading associations based on investigation and treatment of liver diseases in the world and the largest scientific body that upholds the standards and profession, research and create improved treatment methods for millions of liver patients particularly in the entire Asia Pacific region. The scientific knowledge on Hepatitis C is growing very rapidly with the possibility of curing this infection in majority of the patients. The advancement of our understanding in the fields of molecular biology, pathogenesis and immunology of HCV has led to emergence of new and potent therapies; such as Direct Acting Antivirals (DAAs), host targeting antivirals and nucleic acid based therapeutics. The experts from across the globe will give an insight about the most recent concepts related to HCV infection and disease at this conference. In addition, pathogenesis and new management options for liver cancer, difficult-to-treat case scenarios such as patients with HIV or HBV co-infection, patients on renal dialysis, post-transplant patients, patients with advanced cirrhosis and access to new antiviral drugs would be discussed in separate theme sessions during the conference. Prior to the conference, a pre-conference was held on post-graduate course on “Recent Advances in Liver Diseases" in 2015.